What is agility? The 6 minute video at right offers a great explanation of the sport in a fair amount of detail. (Video by Jessica Ajoux - NOT affliated with Creekside). 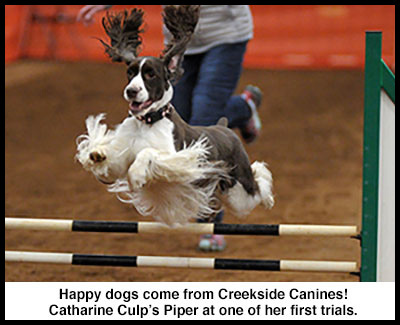 Get off to the right start at Creekside Canines where the training is POSITIVE and reward-based. Dogs are never forced to do anything at Creekside Canines. Instead they are encouraged to think for themselves and are handsomely rewarded for making the choices we like. This approach fosters confident and happy dogs. Is agility right for my dog? Agility is for dogs of all shapes and sizes. It is for both mixed breeds and purebred dogs. Jump heights are based on the size of the dog. In AKC, jump heights start as low as 4 inches and go up to 24 inches. However, agility does require some athletic ability so your dog must be physically sound. See Safety of Dogs below for further info. Puppies can get started now too! While puppies should not jump nor be on full height equipment for safety reasons, there is plenty of foundation training that should be done which will make transitioning to obstacles easy. See below for info on my Performance Puppy class! No prior training needed! I've found that owners and dogs succeed more quickly using a personal approach rather than the more typical classes elsewhere in groups of 6 or 8 or even 10. Here's how I do it at Creekide. 1. Half Hour Evaluation: T he first thing you'll need to do is come for a half hour evaluation. There will be no actual training during this session but rather I will get to know you and your dog so I can determine the best way to proceed. I will evaluate a maximum of 2 dogs during this time so if you have a friend who is also interested, you may share the time. The cost of the evaluation is $26 (discounted to $25 for cash or check) payable at the time of the evaluation. Step 1. Please fill out the New Student Registration Form Here prior to booking your evaluation.Once you click Submit, it will return you to this page and you may book your evaluation using the button below. There is NO obligation in filling out this form! Step 2: Book your half hour evaluation. Note: You will be asked to enter credit card info but your card is NOT CHARGED unless you are a no show with no cancellation notice. Payment is due at the time of the evaluation. Cash, check, Zelle, credit/debit card. 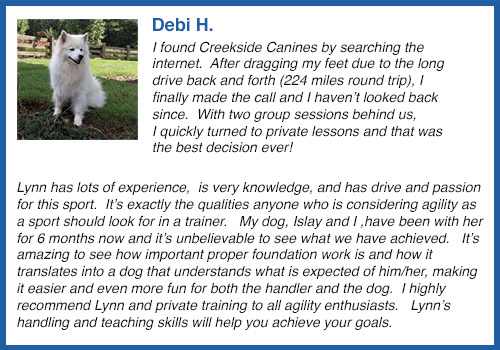 If you have any questions, please feel free to email me at Lynn@CreeksideCanines.com. 2. The Basics: After the evaluation, you might need several private lessons to learn some basics or you may be able to go right into Novice. 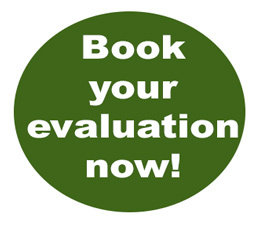 We'll determine this at your evaluation. Some people prefer to continue to work with me privately and that's fine as well. If you have a young puppy, you can join my ongoing Performance Puppy class when it's offered or work with me privately until the class is available or your pup is old enough to join one of the ongoing classes. While there are some things that all agility dogs need, what we cover in these private sessions will be geared specifically for you and your dog. You will also have access to some private training videos so you can work on a number of things at home. That will save you time and money as we can spend your private lesson time on things not covered in the videos and anything you may be having trouble with from the videos. You are welcome to partner up with a friend to share your private lessons with. This helps give the dogs a break as we can take turns working and also helps financially. You will be given access to the training videos right after your first private lesson. Cost: Privates are $60 per hour for 1-2 dogs. If your dog is very young (puppies 8 weeks to 8 months or so), you may just want to do half hour sessions at $30. Private lessons are always payable at the time of the lesson or in advance. And yes, we do start agility training with very young puppies. Obviously they are too young to jump or work on actual obstacles but there is plenty of work to be done with any age dog before they do these things anyway. 3. Ongoing Classes: Most newcomers will need a several private lessons before joining Novice and other classes. When your dog is ready, you may also attend Weaves (if your dog is old enough). Sunday Jumping is also an option when you are able to sequence 3-4 jumps. Or you may choose to continue privately. This is up to you. Many students do some combination of both as time goes on. You can see the current class offerings and read about the punch card system here. Please note that the ongoing class schedule fluctuates throughout the year based on student schedules, weather and Lynn's competition schedule. Once again, the type of training done is POSITIVE, reward-based training. Dogs are never forced to do anything in agility. I am a strong believer in teaching dogs how to think for themselves which creates a more confident dog. Dogs are allowed to learn at their own pace and are rewarded for making the choices that we like. Just like children, every dog is different. Your dog may not progress at the same rate as other dogs. I embrace these differences and work with each dog as an individual. SAFETY OF THE DOGS is my first priority. For this reason, we work "on the flat" meaning we don't put the dogs on obstacles until they've had this foundation (and in the case of young dogs, until they also are physically mature enough to safely negotiate them). We work on obstacle approximations such as boards on the floor, boards that wobble a bit, etc. We will be playing lots of fun games with the dogs to teach them that working/playing with you is fun and rewarding. We will also teach your dog jumping basics (bars on the ground for puppies) and tunnels which most dogs love. Dogs less than one year of age (depending on breed) should NEVER jump full height. In fact, until growth plates close, they shouldn't jump anything higher than their hock. Puppies should also not be taught to weave until growth plates are closed. I teach all my privates and classes on the assumption that everyone will compete. There are two reasons for this. First, the rules for obstacles are for the safety of the dogs and, as stated earlier, I make sure dogs are physically and mentally ready to safely negotiate them. Secondly, many of us who compete in agility had no intention of competing when we first started but ended up there! Either way, it's lots of fun for you and for your dogs and will help you develop a relationship with your dog unlike any other. 1. Has put upper level titles on multiple dogs in either AKC or USDAA. Upper level AKC titles are MX (Master Agility), MXJ (IMaster Jumper) and MACH (Master Agility Champion). 2. Has extensive experience with a wide variety of breeds and mixed breeds. 3. Whose students are competing, earning titles and having a blast with their dogs. 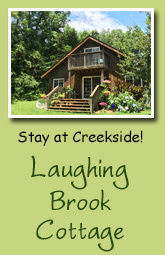 You will find all of this here at Creekside. 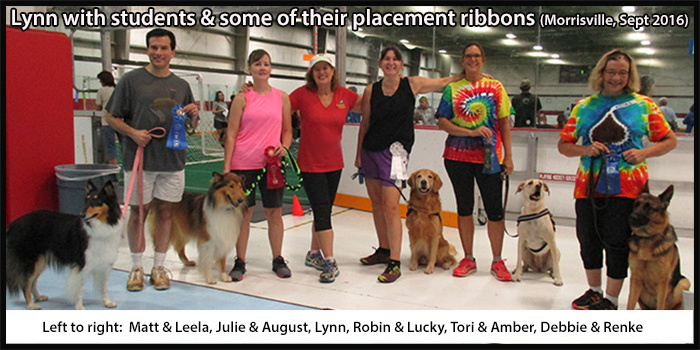 I have a great deal of experience with many breeds and mixes and have put high level agility titles, including two Master Agility Champion titles, on 4 of my own dogs, with a fifth dog just starting to earn her way up the titling ranks. (See the About section for the list of my personal dogs and their titles.) I compete in AKC agility trials at least once a month so my training is up to date and always relevant. My students are excelling in all levels of agility and I'm very proud of them. On top of all that, you will make new friends and become part of a whole new world where everyone is friendly and supportive. Sound good? Email me with any questions.